Political parties are always coalitions of different tendencies, philosophies and opinions. This is especially true in the United States. 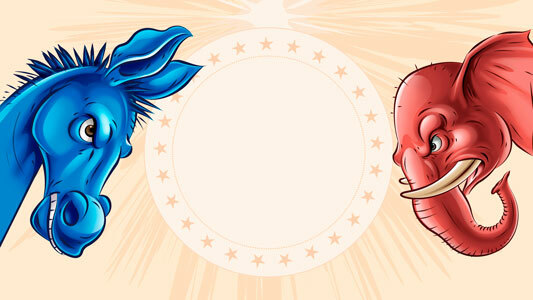 For most of its history, and for all practical purposes, America has had a bipartisan political system. At the time of the last presidential election, there were 245.5 million Americans ages 18 and older. There are more than two political ways of thinking in America today, but we just have two political parties with a real shot at winning a presidential election. The last time an independent candidate had a real effect on an election was probably in 1992. Most pundits at the time thought independent candidate Ross Perot, who got almost 20 million votes, had decided the election for Bill Clinton by taking votes away from President George Bush. But the lack of real opportunities for a candidate outside the two main political parties is not limited to presidential aspirations. For the longest time now, few politicians managed to have a successful career as independents or third-party candidates. These conditions have a homogenizing effect in our political world. While the electorate doesn’t always follow strict patterns of preference on the issues of the day, sometimes the elected officials are bound to toe the party line to get their party’s support. This is especially true for the issue of abortion and the Democratic Party. If you google the phrase “pro-life democrats,” the first three articles that come up have the following headings: “‘If You’re a Pro-life Democrat … You Know You’re Standing Alone’” (Politico Magazine), “This Could Be the End of the Road for Pro-Life Democrats in Congress” (Slate) and “The Uncertain Future of Pro-Life Democrats” (Christianity Today). Between 22 and 30 percent of Democratic voters are pro-life. But the leadership of the party is radically pro-abortion. The concept that Hillary Clinton proposed a quarter century ago of “safe, legal, and rare” abortions has been replaced by some politicians with an enthusiastic promotion of abortion, even in its most gruesome and revolting forms – late-term and partial-birth abortions. Only 29 percent of voters think abortion should be legal under any circumstances, according to a Gallup survey from 2018. But abortion under any circumstances is – in practical terms – what the Reproductive Health Act (RHA) proposes. Recently approved by the New York legislature, it legalizes aborting babies up until moments before birth. The act had passed in the Democratic-controlled assembly multiple times in recent years, only to be rejected in the Republican-controlled Senate. Now the Democrats hold a majority in the Senate too, and this time the act was approved by the upper chamber in a 38-24 vote on Jan. 22, the 46th anniversary of the U.S. Supreme Court’s Roe v. Wade decision establishing a woman’s right to an abortion. The RHA vote was mostly along party lines with two exceptions: Brooklyn Senator Simcha Felder and Queens Senator Joseph Addabbo Jr., both Democrats, voted against expanding access to abortion. Inspired by their ethics, Felder, an Orthodox Jewish politician, and Addabbo, who is Catholic, decided to vote according to their conscience, instead of their party’s platform. They know there is a price to pay for such a decision. The fact that they voted as they did is a sign of hope. Sorry Sen Felder is only in name only a Democrat and was elected as republican,,conservative and on the Independent party lines and currently shunned by both conferences the Democrats and Republicans for being a turncoat and untrustworthy. I may have held my nose to vote for Trump but when I see what agenda the democrats are pushing – socialism, open borders, LGBT etc, unlimited abortion – I thank the good Lord that this is loudmouth stands against the culture of death. He is a wealthy and powerful man and certainly didn’t need this thankless job with its constant dirtslinging and lies. Some say that he doesn’t talk and live like a Christian or a man of God. But if defending the unborn, who can’t vote for him or raise funds for his election isn’t Christian, I don’t know what is. If one thinks back to King David (a murderer and adulterer) or King Solomon (serial adulterer and worshipper of pagan gods), Trump doesn’t look too bad.